The overriding theme relative to the NHI is this: as long as you have an ARC based on employment, you are immediately extended NHI - from midnight of the 1st day of your ARC’s validity. With a valid ARC, your NHI remains intact. Still, teachers and other white-collar workers often face a variety of issues and questions around getting their NHI cards & using them. We’ve tried to tackle some of the most common questions below, along with providing various pieces of advice. Q: I’ve gotten my ARC. How soon should my employer file for an NHI card for me? 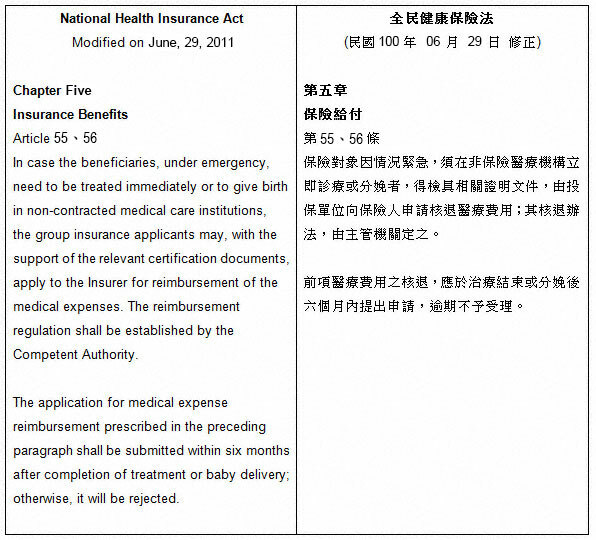 A: By order of the National Health Insurance Act Chapter Two Article 16 your employer is required to file for your NHI card within 3 days of your ARC’s becoming valid. Q: What form does my school need to enroll me in the NHI? Q: How long should it take for my school to get my NHI card once they have filed for it? Q: I got hurt after I got my job but…BEFORE I got my NHI Card. I had to pay high un-subsidized rates for treatment. Can I get reimbursed? 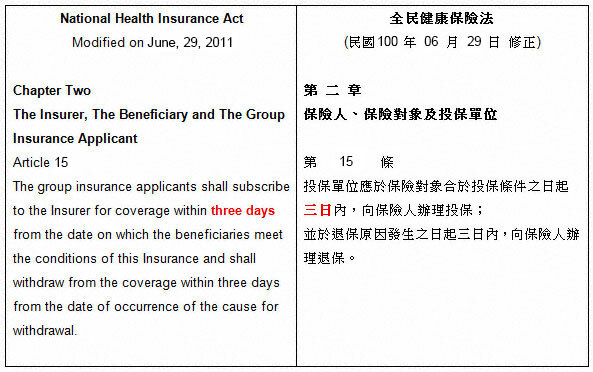 A: Yes, within 6 months of when you got treatment - by order of the National Health Insurance Act Chapter 4, Article 43. Assuming that the hospital or clinic was in the NHI (91.87% are) and the procedures are covered (most are). Here’s an example - your ARC’s validity is from May 10th, 2008 but your employer doesn't apply for your NHI card until July 1st, 2008. As long as your employer pays the insurance fees for May and June then you could submit any medical bills incurred from May10th for re-imbursement. Q: How would I go about getting reimbursed? A: Two ways - it depends on when you get your NHI card. 1. 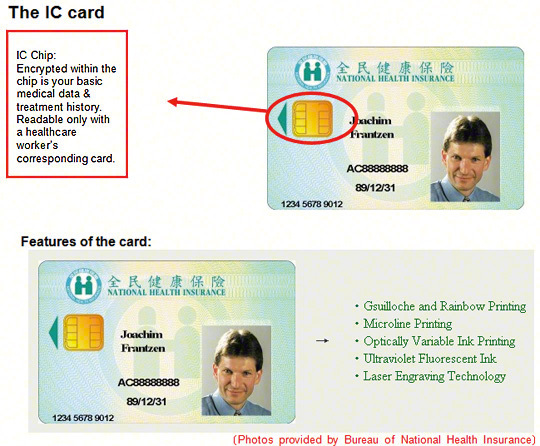 If you get your NHI card within 10 days of having paid the bills then you can go to the hospital or clinic. 2. If more than 10 days has passed between your having paid the bills and getting your NHI card then you need to go to the NHI office nearest you to get reimbursed. There are just six offices for the whole country. If the office closest to you is too far to travel to you can mail them the paperwork. Whatever situation you are in you’ll need the following paperwork from the hospital a form. Not unsurprisingly the form mentioned above lacks a selection for “My boss didn’t give me an NHI card in a timely manner.” among the checkboxes. You’ll need to select choice 7 – Other and attach an explanation. 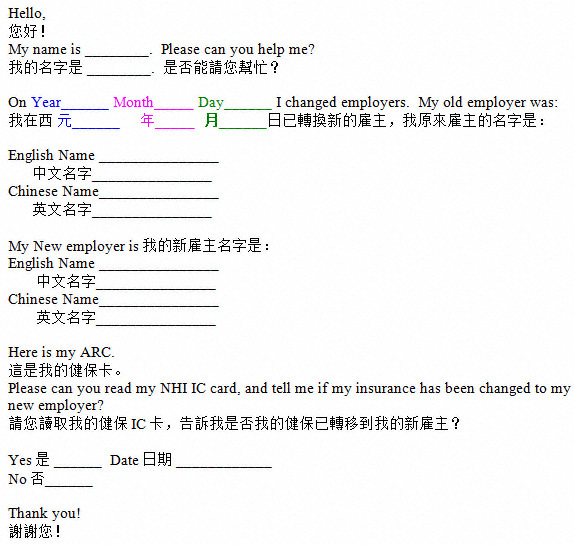 For a printable explanation in English Chinese with blanks for the dates. REMEMBER: Don’t let longer than 6 months pass or you won’t be able to get a refund. Q: My boss told me that he already enrolled me in the NHI. Can I check? A: Yes. Bring your ARC to any NHI Office and they can tell you. If the office closest to you is too far to travel to you can call them. 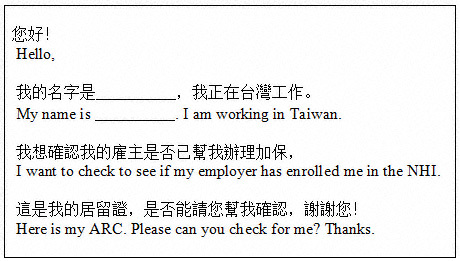 Best to have a Chinese-speaking friend on hand to help you out if you’re going to call. Q: What should I do if my employer hasn’t applied for my NHI card yet? 1. Where an employer misrepresents any fact at the time of his signing of a labor contract in a manner which might mislead his worker and cause him to sustain damage therefrom. 2. Where an employer, his family member or his agent commits violence or extends gross insults at his worker. 3. Where the work specified in the contract has the danger of ruining the health of a worker, and the situation has not been ameliorated after an employer has been advised to make improvements. 4. Where an employer, his agent, or other worker has contracted infectious diseases having the danger of contagion. 5. Where an employer does not make wage payments according to the terms of the labor contract, or does not give sufficient work to a piece-rate worker. 6. Where an employer violates the provisions of a labor contract or labor laws and regulations liable to sustain damage to the rights and interests of a worker. • Did I get hired through a friend I know and trust from back home who’s still working there - in his 2nd year? • How many other native English speaking teachers are at the school? A lot? Then augers more toward the wait-it-out position. • How many of those teachers have stayed more than 1 year? Same as above. • How long has the school been established? 10 years or more, very good – and THIS branch, not the whole company. • Do other teachers have their NHI card, and did they also have to wait for them? From this writer’s experience the no-health-insurance-card right away thing is a bad omen, but not a deal killer, especially if the issues above are all answered positively. But remember, if you are going to use no-NHI-to-quit you need documentation – a receipt from the doctor where you paid full the no-NHI-rate for some treatment – and you need to act within 30 days of that time. To read a complete report on Article 14 please click here. Q: I have checked a few times now & I found that my boss still hasn’t enrolled me in the NHI, though I have repeatedly asked him to do so. Can I just enroll myself? A: Yes, though it may not be the best thing for you to do. I’ll explain that shortly. But, if you wanted to go ahead & enroll yourself: go back to the same NHI office you’ve been checking at so far. Let them know what’s happening. They will enroll you manually. Get the name card of the person who helps you. This will also open an investigation and a fine process against your employer, which will probably get you fired. If your employer is not giving you NHI in a timely fashion best to document it and then consider if you want to use that as grounds to quit (within 30 days), as outlined in the question immediately above. 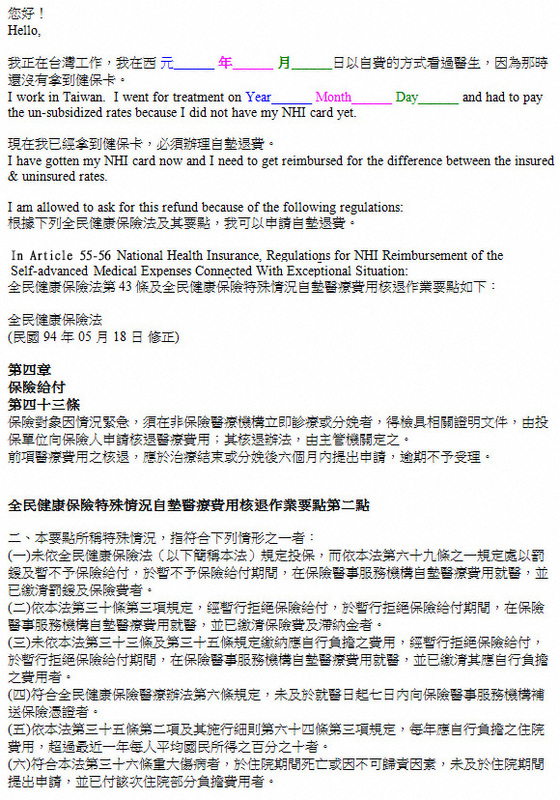 Q: Is there a penalty for not enrolling an employee in the NHI? A: Yes, but it is not very compelling – the employer would be fined two times the employer’s monthly insurance premium contribution for that employee. Q: If I change jobs is there a deadline by which my new employer needs to apply for my NHI? Q: My new boss told me that he already enrolled me in the NHI. Can I check? Q: I’m married. Who is included in my NHI? A: Assuming they are with you: your wife, children and YOUR parents (not your wife’s – her parents would be covered by her NHI were she working). 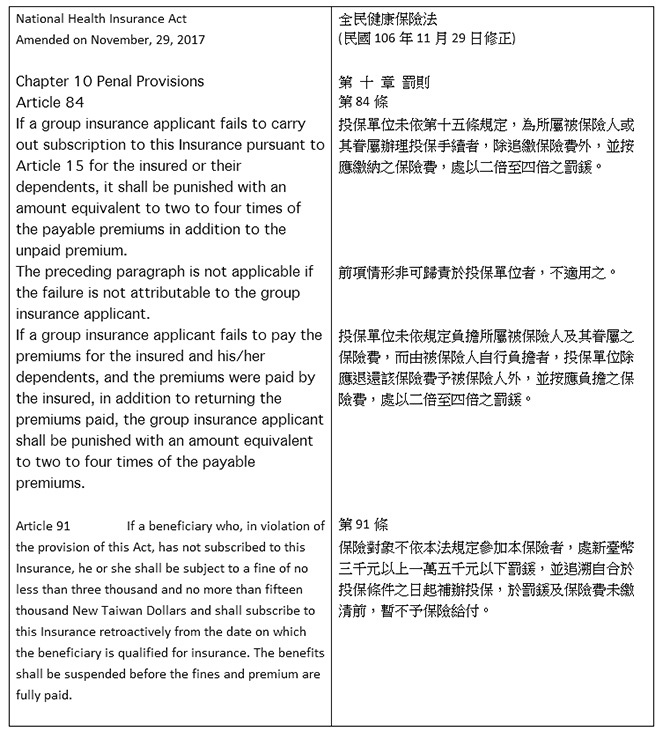 Chapter 2 Articles 8 10 of the National Health Insurance Act. Q: How much do I have to pay for the NHI each month? Click here for the request. Q: Do I make my NHI payments in cash to my school or is it deducted from my salary? A: Believe it or not… there is no rule on this. Your school could ask you to give them the premium in cash each month, though in MOST CASES you’ll see it as a deduction from your gross pay. Seen sometimes at small schools as the 1st payment they ask from you in cash then all the successive ones are deducted – that 1st month being when the accountant gets you worked into the system. Q: I have NHI but...are there still fees that I need to pay when I go to see the doctor? A: Yes. 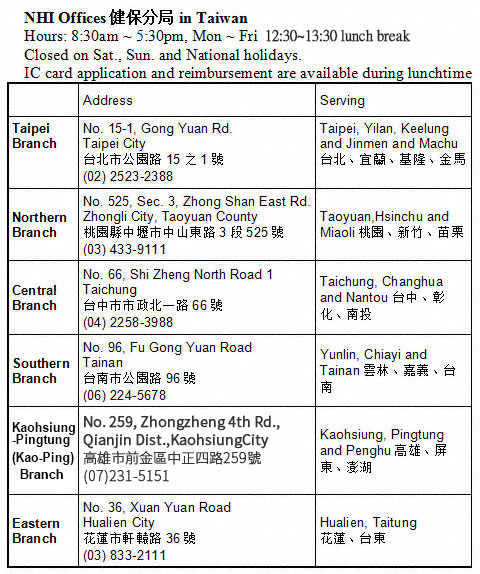 Almost everywhere you’ll see registration fees paid in the waiting room, ranging from NT$50 ~ 150. Then, there are co-payments charged afterward for different types of procedures. Surgery in-hospital procedure co-payment costs start at 5% for non-emergency and 10% for emergency procedures when you are treated for 30 days or less. The percentages rise if you need to stay in the hospital more days. Q: If I am prescribed medicine, do I have to pay anything? 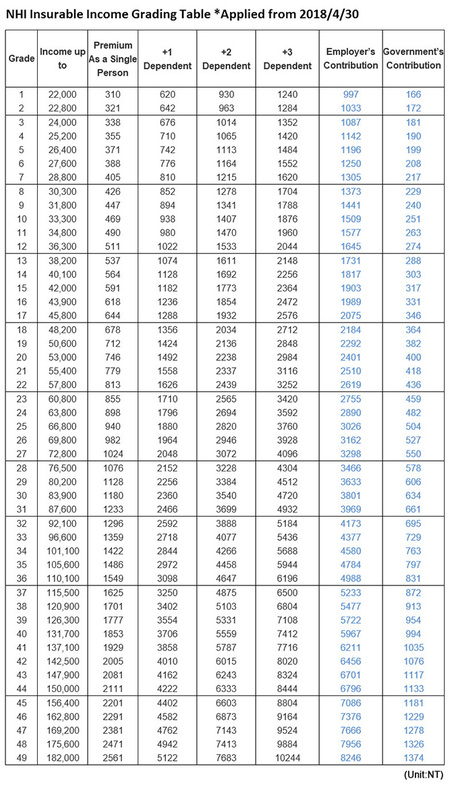 A: Yes, the co-payment portion of the medication, described in the table below. Q: I lost my NHI Card. What should I do? 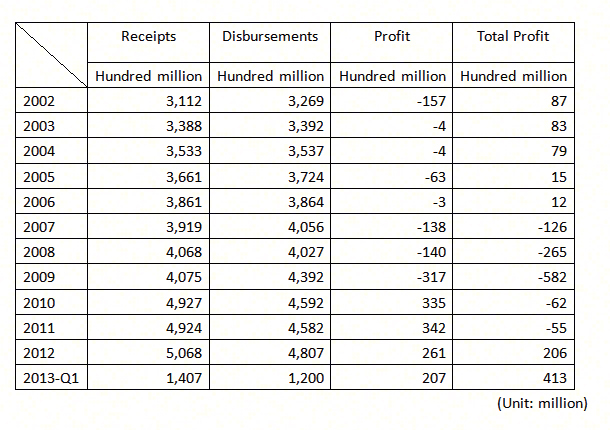 Q: What are the annual outlays and receipts for the NHI? Q:What’s up with the logo? Q:When did they system begin? Q:What did people do before the NHI? A:There were separate systems. One for government employees, one for all other types of workers and various private insurance systems. Incidence of being uninsured was common. Q:How many hospitals are there in Taiwan? Q: Is psychological care covered? Q: Can I just go to a hospital to do all my NHI administrative stuff? A: Nope. Some things just have to go through the NHI. Q:My income level wasn't covered in the earlier question. Is there a complete list? A:Here are the NHI Premiums for a range of Category 1 - Employees of Private Businesses - Income levels. Bushiban teachers are considered Category 1 employees.